He Who Must Not Be Named (you know, No-nose) is gathering his dark forces to attack Hogwarts. Who might be able to take on such a dastardly foe? Certainly not the fully-grown, experienced wizards at the school. It's up to a plucky gang of students to get things done. Only Harry, Ron, Hermione, and Neville can stem the tide of evil and shore up Hogwarts' defenses. 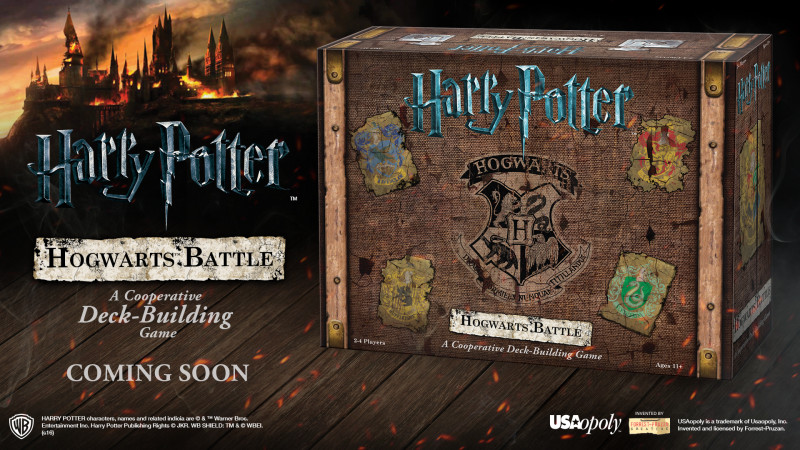 That's the story in the new Harry Potter Deck-building Game just announced by USAOpoloy. In the game, players will pick one of the four characters to play as. Each one has their own, unique deck of cards, representing the different abilities, spells, and strengths of those students. In this cooperative game, you'll have to beat back the various forces looking to destroy the school, gaining new spells and abilities as you go on. Only by working together will you win. The game's going to be available in limited numbers at Gen Con, with a general release to follow.